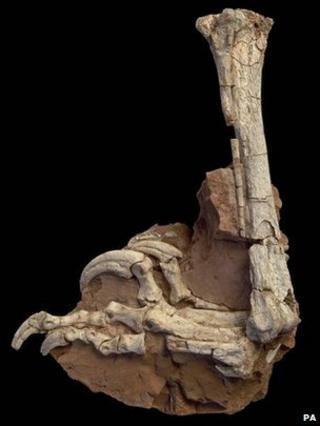 Fossils of a new type of dinosaur, which looks like a beefy version of the predatory Velociraptor, have been unearthed in Romania. The stocky dinosaur lived some 70 million years ago; higher sea levels at this time would have made the region an island archipelago. The animal is also notable for the two large and sharp claws on each foot; Velociraptor had just one. It may have used these to rip apart its prey scientists believe. The find is reported in Proceedings of the National Academy of Sciences journal. It has been given the scientific name Balaur bondoc, which means "stocky dragon". "Balaur might be one of the largest predators in this ecosystem," said co-author Zoltan Csiki from the University of Bucharest, Romania. He said that while the 1.8m-2.1m (6-7ft) -long creature is extremely unusual, it is closely related to animals like Velociraptor and feathered dinosaurs uncovered in China. The new Balaur fossil is a partial skeleton that includes leg, hip, backbone, arms, hand, rib, and tail bones. It had a big toe with a large claw that it was able to extend - presumably used to slash prey - as well as a large claw on the second toe. Balaur had short and stocky feet and legs, and the pelvis had enormous muscle attachment areas, indicating that it was adapted for strength rather than speed. Some bones in the animal's hand are fused, features that would have made grasping difficult. Stephen Brusatte, a graduate student at Columbia University in Palisades, US, said: "Compared to Velociraptor, [this dinosaur] was probably more of a kickboxer than a sprinter, and it might have been able to take down larger animals than itself, as many carnivores do today." However, researchers stressed that it was difficult to tell how it hunted or what the animal ate.